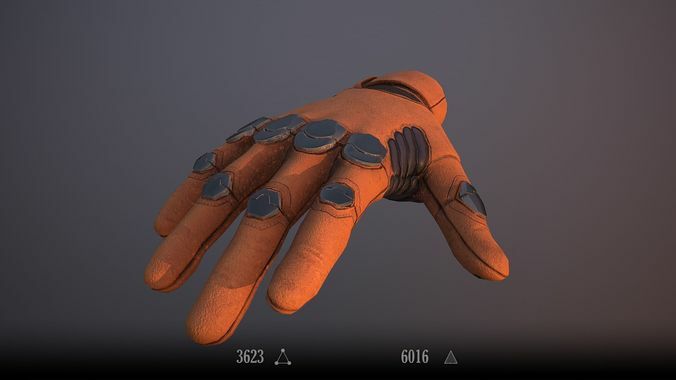 A Rigged and Game ready Sci-Fi Glove with easy to customize texture setup. Comes with most Animations you will need to get started. Fully rigged and provided files are .max ans .fbx so is easy to import the FBX into Maya or Blender to make modifications there. See full animation ranges Below. Texture Maps: Albedo(4096*4096px(4k)) ; 4 Colour versions, ID Map (4k), AO (4k), Curvature (4k). Gloss, NormalMap , Metalness each also 4k texture sizes. Bonus textures also added. Medium-Low Poly Range Polys: 3009 Tris: 6016 Verts:3623 Ideal for VR and could work on high end mobile with some reduction in the textures used. Good model, useful animations for both Oculus and Vive setups.